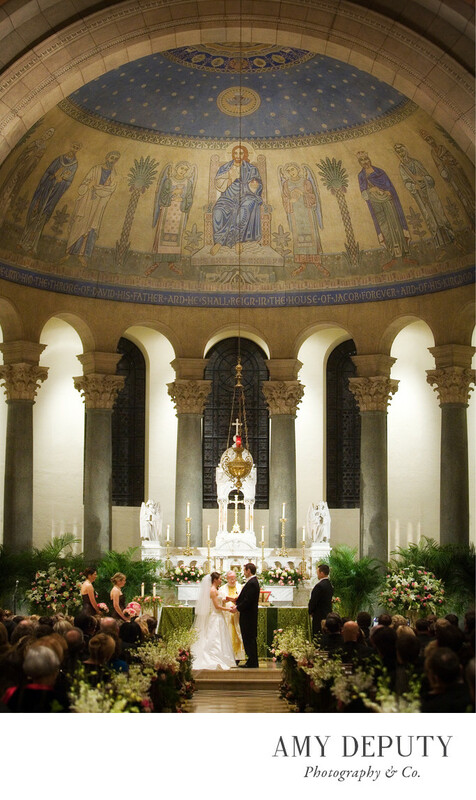 With links to the Johns Hopkins University, the Saints Philip and James Catholic Church & University Parish is a popular wedding ceremony venue for Johns Hopkins students, grads, and the greater Baltimore Catholic community. Dating back to the late 19th century and a work of Baltimore architect Theodore Wells Pietsch, this Roman Catholic Church in Baltimore's Charles Village neighborhood features Greco-Roman and Byzantine details: a spectacular mural decorating the dome that rises above the marble alter, inspiring stained glass windows; grand columns and archways. Saints Philip and James Catholic Church is a magnificent wedding venue for pledging sacred vows to one's beloved. The church surrounds couples and their guests with an ethereal sanctuary, reflective of the momentous occasion for which they have gathered. It is a grand venue that also shows spectacularly in photographs. Location: Saints Philip and James Catholic Church: 2801 N Charles St, Baltimore, MD 21218.